Haredi ministers will meet Tuesday with Tourism Minister Levin and demand the right to enforce Shabbat laws and legislation of status quo. The heads of the haredi parties will meet Tuesday with Tourism Minister Yariv Levin and will demand that he adopt a number of measures to maintain the status quo regarding Shabbat. Levin was appointed Sunday to determine guidelines for maintaining the status quo regarding the issue of Shabbat in the public arena. During the meeting, Interior Minister Aryeh Deri (Shas) is expected to demand authorization to enforce the law against stores which desecrate the Shabbat in violation of the law be transferred to his ministry. Moshe Gafni (UTJ) will demand that a law be legislated restoring the level of Shabbat observance in the public arena to what it was before the Tel Aviv by-law was passed. 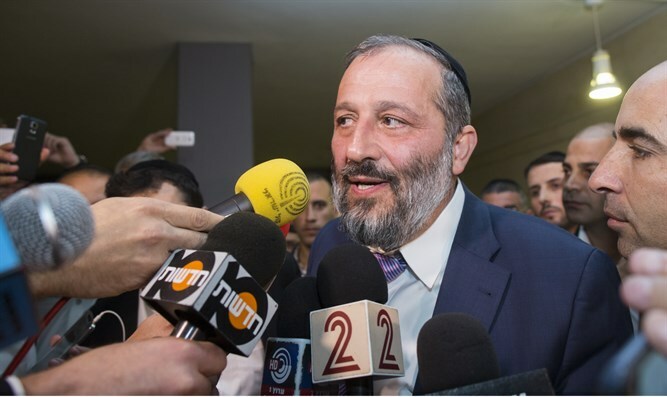 Interior Minister Deri will also participate in a discussion with Attorney General Avichai Mandelblit regarding his demand to petition the Supreme Court to hold another hearing before a broader panel in connection with the Tel Aviv by-law. The new by-law permits stores in Tel Aviv to open on Shabbat legally. Erez Kremnitz, the deputy Attorney-General and a representative of the State Prosecution, Attorney Gili Mon, will also participate in the discussion. The president of the Shas Council of Torah Sages, Rabbi Shalom Cohen, said Monday that the party would leave the government if it did not win the battle against the Supreme Court which recently authorized by-laws permitting the opening of Tel Aviv stores on Shabbat. During a rally in Tel Aviv Rabbi Cohen said that "the Supreme Court is making all the trouble for us regarding Shabbat desecrations. They are in control today. We must fight what the Supreme Court is doing and if it does not succeed - leave the government."